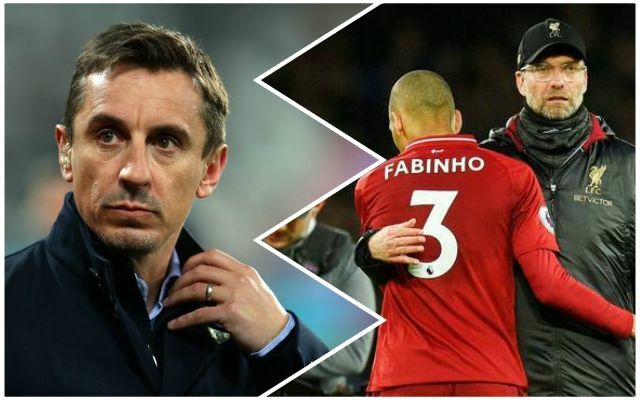 We’re not sure if there are mind games being played over in Manchester, or if it’s simply an honest opinion, but former Manchester United defender-turned-pundit, Gary Neville, has made some bold claims about us. Speaking on the Gary Neville Podcast for Sky Sports, Neville declared: “Getting points on the board is a big advantage. I always thought that if Liverpool could win the league this season then they’d need a clean fixture list. At least he’s honest with himself; it is madness, pure and utter madness. We’ve got the pedigree to go for both, and that’s exactly what Jürgen and the boys will aim to do. After making the claim, Neville at least saw some sense, backtracking somewhat by stating: “Of course, you’d never play to lose a game but it will be in Liverpool’s favour if they have a clean run as they can get everyone fresh. City have got a couple of FA Cup games, where Liverpool could go five or six points in front. That’s tough to pull back in the closing weeks. That’s more like it Gary. We didn’t see Manchester City losing their heads when they were a point behind, and we’ll keep our resolve too. Yes, we handed top spot back to City on Sunday, but there’s still about a quarter of the season still to be played. We’ll be welcoming Tottenham to Anfield later on in March, and if we get past Bayern Munich, the two legs of the quarter-final would straddle Chelsea’s visit on April 14th. There will be many more twists and turns in this title race so let’s keep fighting for Premier League and European glory!